In 3-quart saucepan, mix beans, broth, tomatoes, chicken and taco seasoning mix. Heat to boiling over medium-high heat. Cover; reduce heat to low. Cook 10 minutes, stirring occasionally to blend flavors. Serve with cheese and tortilla chips. You can purchase shredded rotisserie chicken at your grocery store. Top off this easy soup with a sprinkle of fresh cilantro or green onion. Or, add a dollop of sour cream, not only will it look great, it will taste even better. 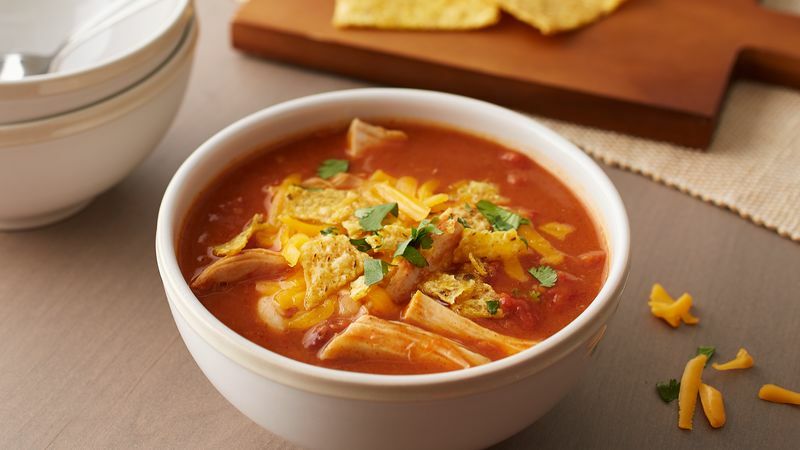 This easy chicken tortilla soup checks all the boxes: it’s packed with flavor, ready in less than 30 minutes and is all made in one pot. Score! Why go to the restaurant to order it when it’s that easy to make (and requires close to no cleanup)? 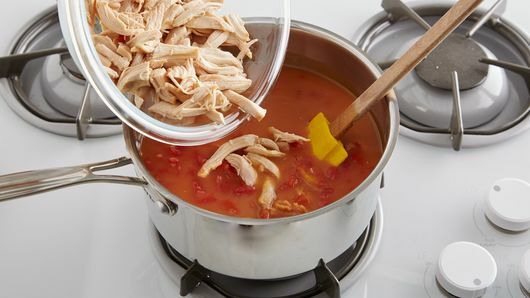 You can make things easy on yourself and use pre-cooked rotisserie chicken like this recipe suggests, but if you have a few chicken breasts in your freezer, you can cook those up for this soup too. Allow them to defrost overnight, then sprinkle with some extra taco seasoning and bake them in the oven at 375°F for about 30 minutes or until the center reaches 165°F. Then just shred the chicken and add them to your soup. Is chicken your favorite dinner protein? 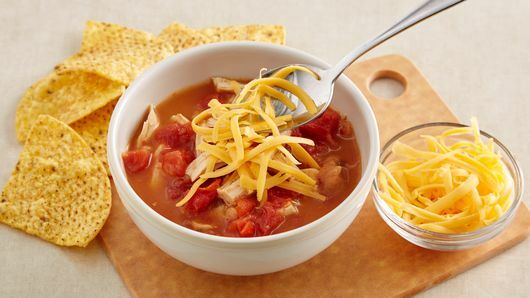 You’ll never run out of chicken soup ideas, thanks to our long list of recipes Once you’ve picked out a few, don’t forget to read this article for tasty topping ideas and side dishes to round out your meal.